I would put my money on NO. My guess is the guy probably went on a bad dinner date. Always seek adventure! That’s what I say at least. Agreed – there’s what actually happened, and the story we tell ourselves. 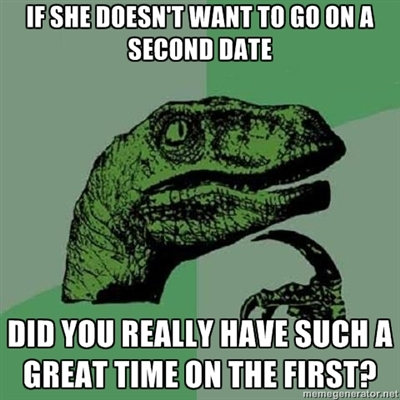 If a girl doesn’t want to go on a second date, she very likely didn’t think the first one was any good. Amen! I believe I’ve seen you on Seddit before. You have great posts! Thanks! Yeah, on seddit, my handle is “itsmevichet” – saw your post on 10 things you wish you’d done in college. Resonated with me. Thanks for taking the time to comment!